but none are taken away. For a number of weeks, Untitled (fault) was the only work on view in this cavernous industrial space. Its mass was minimal – two powered speakers, mixer, turntable and acetate record – but its presence filled the whole volume of the space. 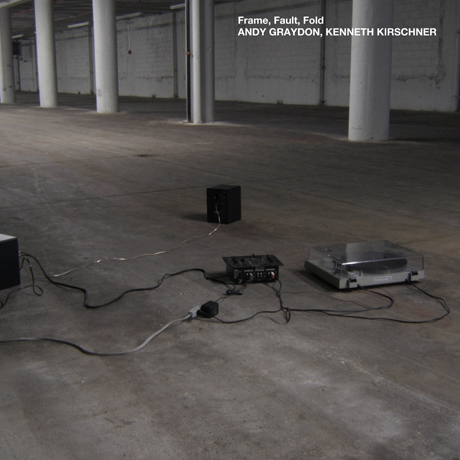 Untitled (fault) is an acetate record that contains field recordings taken by Andy at an exhibition of 19th century photography at the Metropolitan Museum of Art. One side of the disc consists of a single durational recording; the other side comprises a series of locked grooves – short audio clips that repeat over and over as the record turns. The first thing that drew me to Untitled (fault) was its relationship to museum spaces. The piece takes audio from one space and overlays it on top of another. When Andy and I first tested the piece at Marian Spore, it was surprisingly transformative. Ghosts of detached voices wafted through the space, and the hum of ventilation created an institutional atmosphere. Museum exhibitions are typically documented only through installation photographs, which circulate widely and are a primary avenue for most audiences' encounters with artwork. Untitled (fault) reminds us that the reception of artwork is situated, embodied and contingent. As I sat with Untitled (fault) each week during Marian Spore's open hours, my relationship with it began to change. I liked the way its waves described the hard flat perimeter of the space. One visitor drew my attention to how the audio continued to reverberate in the space for several moments after shutting off the speakers. The sound began to seem like something felt more than listened to, a physical presence rather than a signal. The physicality of the record is also important to the work. Acetate is a malleable material normally used only for test pressings in the production of a vinyl record. After a few listens, they begin to wear out. But it is this very temporariness that Graydon prizes. to remember what it once sounded like so that you may chart its evolution. Now, Marian Spore has been open for nearly seven months. Four other works are installed alongside Untitled (fault). Continuous use each Sunday has nearly worn away all of the locked grooves, which are filled with a fine blue acetate dust. The durational recording, which has seen less use, is also steadily deteriorating. Perhaps the object is nearing the end of its useful life. Still, even in its most obliterated parts, I still imagine that I can detect the contours of the original recording.